Rhagoletis pomonella is known as the apple maggot fly, the apple fruit fly, or the railroad worm. Apples aren't the only host plants for the apple maggot; they can sometimes be found on blueberries, cherries, pears, and plums as well. Most of the damage caused is to the fruit. 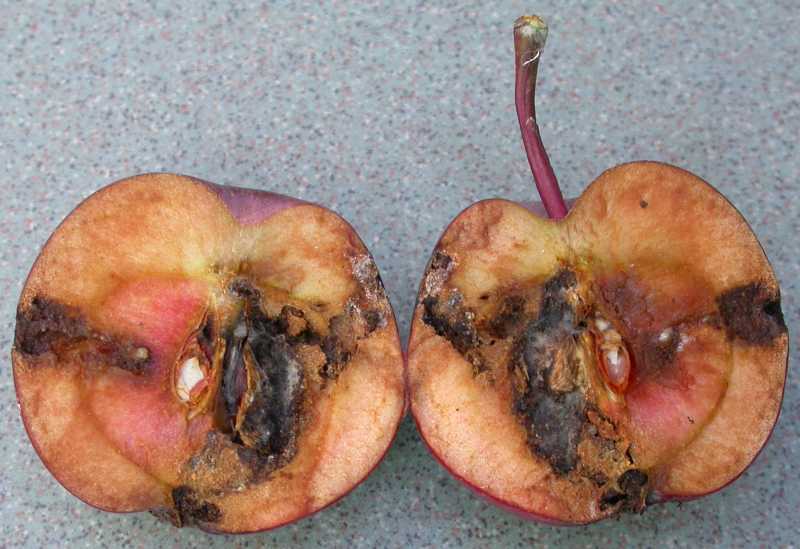 Apple maggot is a more serious problem on early-maturing varieties of apples. This insect also causes damage to fruit of ornamental flowering crabapples and hawthorn trees. 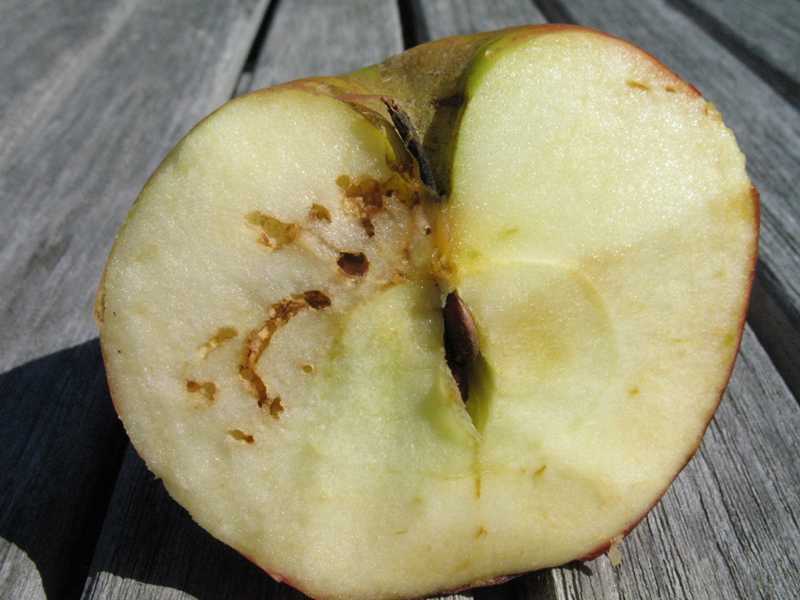 Apple maggot injury will vary among apple cultivars. Fruit may be dimpled or distorted where the female fly has laid eggs. White or yellowish worms emerge from the eggs and are found in the developing fruit. The young larvae tunnel through the fruit, leaving small, brown trails. Small pits may be observed on the skin; these holes are where mature larvae have emerged from the fruit. Infested fruit drop prematurely. 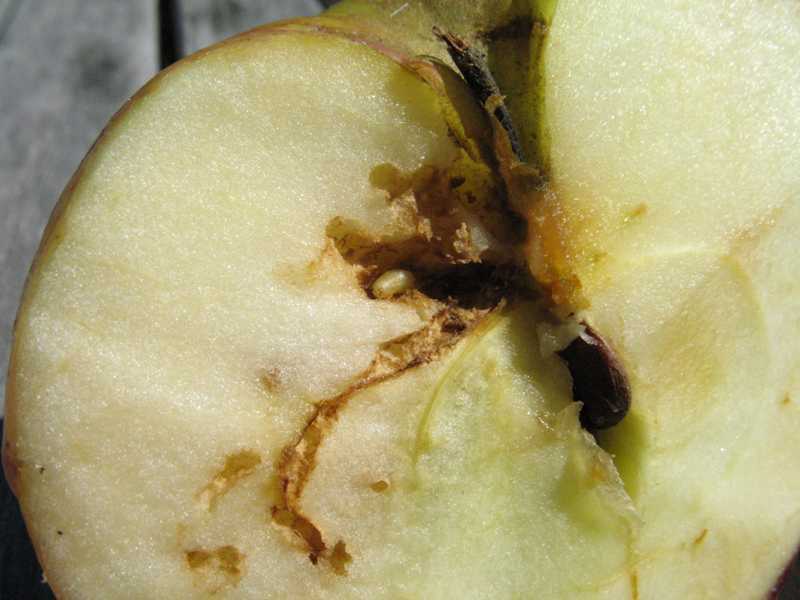 If you slice open a fallen fruit, numerous brown thread-like tunnels are evidence of larval feeding damage. Pupae overwinter in the soil, and adults begin emerging in late May continuing through August. Eggs are laid on the fruit and larvae will hatch in about three weeks. At 1/4 inch long, the adult is slightly smaller than a common housefly. It has a black body with markings on the legs and white bands across the abdomen. The wings of the adult fly are clear with distinguishing black bands. There may be up to two generations per year. 1.Prevent adult flies from laying eggs within the developing fruit. There is no control once the maggots are feeding inside the fruit. Yellow sticky traps for flies can be found in most garden supply shops. Six to eight traps should be hung in a fullsized tree. Do not leave traps in trees for more than a month from the time adults begin to emerge because the traps may attract some beneficials as well. 2. Clean up fallen fruit regularly so that larvae don't have a chance to burrow into the ground and pupate, becoming a problem the following season. 3. Avoid planting ‘Cortland’, ‘Wealthy’, ‘Delicious’, and other early-maturing apple varieties because they are the most susceptible varieties. 4. 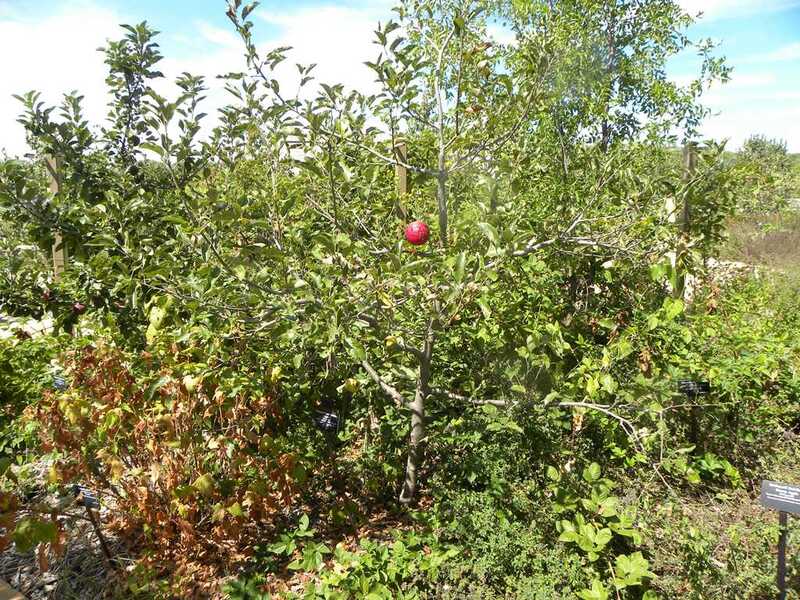 Do not plant hawthorns or crabapples in the vicinity of apple trees because these ornamentals may harbor apple maggots that may also infest the fruit on nearby apple trees. 5. Use chemicals. Pesticides registered for use include carbaryl (Sevin) phosmet (Imidan) esfenvalerate (Ortho Bug-B-Gon Garden and Landscape Insect Killer) and pyrethrins. Strategies 1, 2, 3, and 4 are strictly organic approaches. For an organic approach to Strategies 5, consult the Organic Materials Review Institute (OMRI™) for appropriate pyrethrin products. 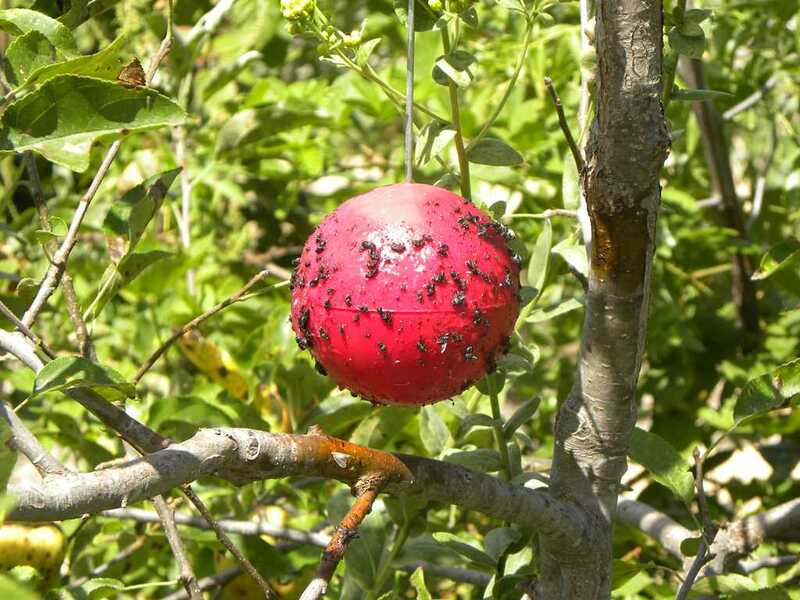 Red apple maggot sticky trap for trapping adult flies (Diptera) hanging in an apple tree.